Since then a lot of people asked me for a more realistic example than the one used originally. This post shows how you split your unit and integration tests using the original method in a realistic environment where the application is actually deployed to a server. We use Maven to build and unit test some Spring based restful webservices. We then use the Maven Jetty plugin to start a Web server and deploy them to it. This article is aimed squarely at showing how to use Maven in a realistic way to start and deploy a set of services to a running server, before running your integration tests. It is not about the subtle details of REST or Spring MVC. I'll cover this lightly enough to build a working application whilst providing references to more in depth articles for those that want more details. The full code is hosted at google code. Use the following commands to check it out and run it. Make sure you have nothing running on port 8080 before running the tests. You can see the full build on the following Cloudbees hosted Jenkins instance. The tests in the standard maven test structure are run during the unit test phase as usual. The hsqldb in-memory database is started and the schema created. 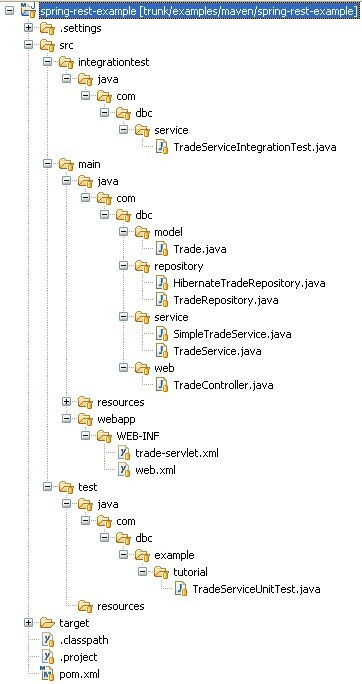 The tests in the \src\integrationtest\java directory are run during the integration test phase. The trade service is very simple. It uses a repository to create and find trades. I haven't included exceptions to keep the whole thing as simple as possible. The only trick here is to add the @Service annotation, otherwise it is straight Java. The above service uses a trade repository to create and find trades. We use the Spring class HibernateDaoSupport to create this class and keep things simple. By extending this class we simply need to create our trade object class, and define our database details in the spring config. All of the other details are taken care of by the framework. The @Entity annotation marks the object as a database entity. The @Id annotation shows which field we want to be our table primary key. For the rest of the fields we use default behaviour so no other annotations are required. A new instance of this will be created every time we start the server. This property tells hibernate to update the database when the application starts. It will effectively create the table for the trade object from the annotations on our trade object. When you run the tests, you will see that the following SQL is executed on startup. Thats a new database setup and ready to go. The Spring controller is the key to this whole example. It is the controller that takes our requests and passes them to the trade Service for processing. It defines the restful interface. We use @PathVariable to make things simple. requesting /find/trade/1 will populate reference with "1"
requesting /find/trade/29 will populate reference with "29"
Next we define a mapping to the servlet. This mapping will pass all requests to our servlet. The Spring configuration consists of a number of distinct elements. This scary looking piece of XML does the job of making sure that the Trade object is returned as XML. XStream will take the object and automatically convert to an XML Format. The Trade class defines the XStream annotation for this. I use the Jetty Plugin to start the server and deploy the war file contained the services. The integration tests are run using failsafe as described in the orginal article. We use the new Spring RestTemplate to make the call to the service easy.